Flower beds can be easily made, once you know where you will set it, what type of plants you will plant in and of course what material you will use for the edging. And although there are many alternatives for the edging or border, you can never be wrong if you choose stones. So, today, we want to show you how you can easily make stunning stone flower beds. Mark the bed by laying a garden hose around the perimeter. Pour sand on the top of the hose and remove the hose to get a clear line. Then, dig a trench 2” wider than the stones and 3” deep. Fill with 2” of gravel and tamp firm with a hand tamper and after that add sand. Now it’s time to set the first row of stones butted against each other. Set the second and subsequent stones on top. Fill the bed with light topsoil with plenty of peat moss so that it can drain easily. 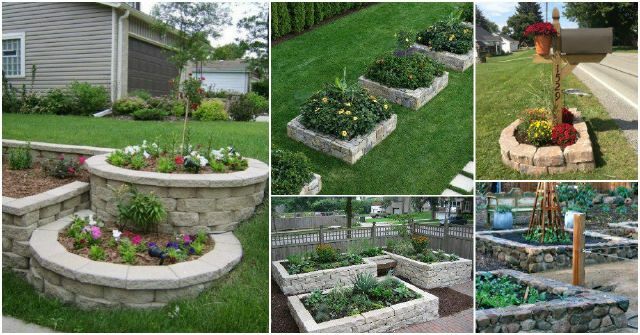 And now keep on scrolling to see some amazing stone flower beds that you can get inspired from. Enjoy! Besides using stones for making flower beds, some bigger ones can be also turned into amazing planters. Like this one here are great for planting succulents. And they look absolutely awesome thanks to the rich hues and texture of succulents that make one perfect combo with the stones.